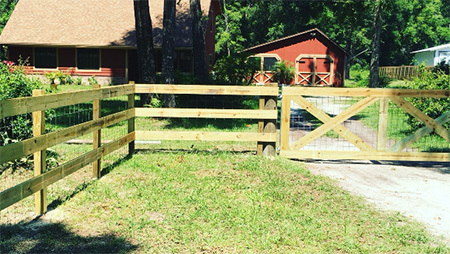 Better Fence Company was established in 1999 in DeLand, FL and is co-owned by Chris Newman and Jason Harcus, both long-time residents of Volusia County. Better Fence Company is fully licensed and insured and we are a member of the American Fence Association. For more information about Better Fence Company and the services we offer please contact us at 386-985-5981. Chris and his crew built us a stunning wooden fence and custom gate for our first home. From the beginning, Better Fence listened to all of our wishes and went above and beyond to exceed our expectations. They truly provided one of the best customer service experiences we have ever had, with a fair price. The crew was courteous and diligent, and the materials that they used are aesthetically pleasing and of top-notch quality. We will be using BFC for all of our future fencing needs, and we cannot say thank you enough for the wonderful experience.